Takahashi FSQ-106ED @ f/5.0 (530 mm F.L.) Captured at 2.1 arcsec/pixel. Shown at 4.2 and 9.39 arcsec/pixel. SBIG STF-8300M Self Guiding Package w/ mono ST-i, using Baader LRGB filters. 5/31/2013 to 7/9/2013 Chino Valley, AZ... with CCDAutoPilot5 & CCDSoft. CCDSoft, CCDStack, PixInsight and Photoshop CS6. 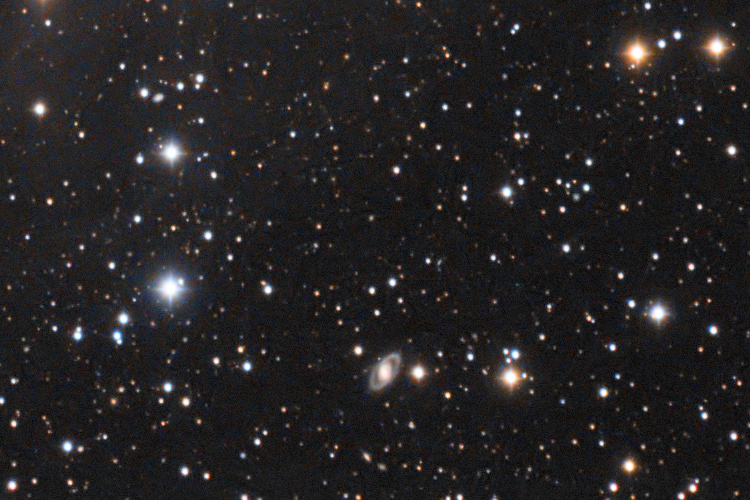 No SDSS stars were available for color balancing, so a standard image-train color calibration was used, as determined by eXcalibrator v4.2, and then adjusted for altitude extinction. CCDStack to calibrate, register, normalize, data reject, combine the sub exposures and to create the RGB image. PixInsight for gradient removal and initial non-linear stretching. PhotoShop for the LRGB combine & final touch-up. Noiseware 5, a PhotoShop plug-in. North is to the top. 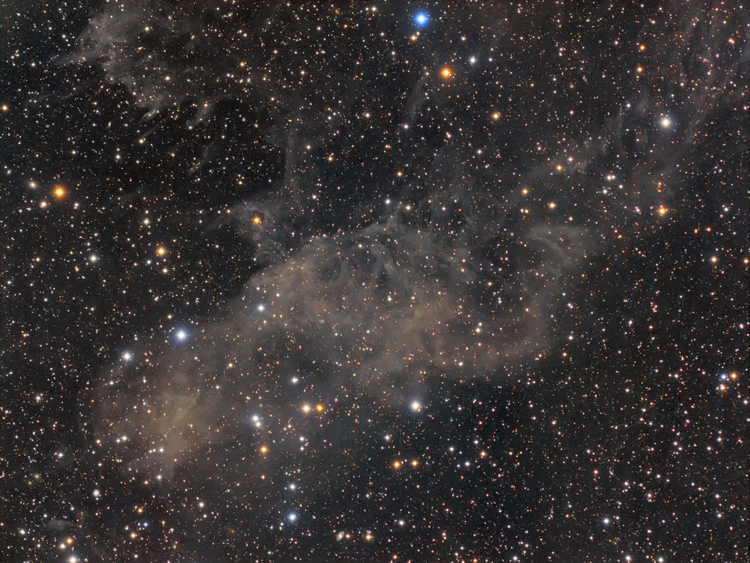 Beverly Lynds Bright Nebula (LBN) 406 is a very faint Molecular Cloud in the constellation Draco. On her brightness scale of 1 to 6, Lynds classified this nebula as a barely visible, 1. The stellar winds have created some interesting shapes. This area is often called The Laughing Skull Nebula. At the very bottom center is the small galaxy, UGC 10548, that looks like the planet Saturn. A Higher resolution telescope reveals two distinct arms and not a ring.